Before transferring to Purdue's College of Liberal Arts, senior Francis Funk spent two years at Ivy Tech, a local community college, earning his Associate's Degree in general studies. 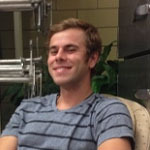 While at Ivy Tech, Francis planned ahead to make sure classes he took there would transfer into Purdue's Liberal Arts core curriculum requirements. During the transition from Ivy Tech to Purdue, Francis used resources such as family friends who worked in the College to help make the transition smooth, commenting that he "had no complaints about the transfer process." Francis advises Ivy Tech students hoping to transfer to Purdue that "Going to class is a big part of achieving in college. Make sure you get good grades before coming to Purdue. Even if you think you know enough to get by, it's always better to go to class. ."
Francis added that his favorite class at Purdue has been Introduction to Communication Theory (COM 102) with Professor Glenn Sparks, but that every class he's taken has been beneficial. As to why Francis chose to study communication, it came down to his so-far undefined career goals. "There is a lot of choice as to what classes you can take in Liberal Arts, so you get exposure to a broad range of topics, Francis says. "The breadth and depth of class material is helpful to students, like myself, who haven’t strictly planned out their future." Why study communication at Purdue? Francis notes that the availability of his professors has helped him succeed here. "They are extremely helpful, and seem to put the needs of the students before themselves," says Francis. Francis' next steps include graduating from Purdue's College of Liberal Arts with a degree in Corporate Communication and landing a job.